NEW YORK (AP) — For the past 2½ months, one thing has been clear in the NFL: Drew Brees and the New Orleans Saints are hard to stop. 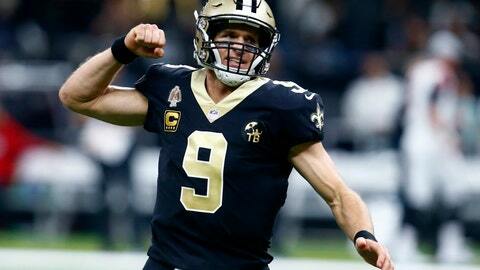 The Saints’ winning streak reached 10 games with their 31-17 victory over Atlanta on Thanksgiving night. The Saints will play their second consecutive Thursday night game when they open Week 13 by facing the Dallas Cowboys. And it’s not the least bit surprising that the surging Saints kept the No. 1 spot in the latest AP Pro32 poll. They received all 12 first-place votes and 384 points in balloting Tuesday by media members who regularly cover the NFL. The league’s other 10-1 team, the Los Angeles Rams, stayed at No. 2 after its bye week. And the Kansas City Chiefs, who also were on a bye last week, remained No. 3. Tom Brady and the New England Patriots are still No. 4 after disposing of the New York Jets 27-13. The only change in the top five was the Chicago Bears, who inched up a spot to No. 5 after topping the Lions 23-16 on Thanksgiving as backup quarterback Chase Daniel threw for 230 yards and two touchdowns in place of the injured Mitchell Trubisky. The Los Angeles Chargers jumped two places to No. 6 after dominating Arizona 45-10 as Philip Rivers tied the NFL mark for consecutive completions at 25 and the broke record for the most to start a game. And the Houston Texans, who have won eight in a row after a 0-3 start, remained No. 7 after topping the Tennessee Titans 34-17 on Monday night. “The surging Texans honored late owner Bob McNair with an eighth consecutive victory behind a powerful ground game and the usual stingy defense,” said Ira Kaufman of Fox 13 in Tampa, Florida. The Pittsburgh Steelers dropped three spots to No. 8 after their 24-17 loss at Denver. “Big Ben blows the game in Denver,” Fox Sports’ John Czarnecki said of Steelers quarterback Ben Roethlisberger, who threw for 462 yards but had two interceptions and now has 12 for the season. They will look to rebound Sunday night when they host the Chargers, who are expected to be without running back Melvin Gordon, who sprained the medial collateral ligament in his right knee during the rout of the Cardinals. The Minnesota Vikings and Seattle Seahawks, who are both in contention for wild-card spots in the NFC, each moved up a spot to Nos. 9 and 10. Among the teams making the biggest drop was the Cincinnati Bengals, who plummeted five spots to No. 24. They have lost five of six after a 4-1 start and will finish the season without quarterback Andy Dalton, who went on injured reserve with a thumb injury to his throwing hand. “The record may not show it, but this could very well be the NFL’s worst team by year’s end,” said Alex Marvez of Sirius XM.